Deric's MindBlog: Anti-aging molecule produced during fasting. β-hydroxybutyrate (β-HB) elevation during fasting or caloric restriction is believed to induce anti-aging effects and alleviate aging-related neurodegeneration. However, whether β-HB alters the senescence pathway in vascular cells remains unknown. Here we report that β-HB promotes vascular cell quiescence, which significantly inhibits both stress-induced premature senescence and replicative senescence through p53-independent mechanisms. Further, we identify heterogeneous nuclear ribonucleoprotein A1 (hnRNP A1) as a direct binding target of β-HB. β-HB binding to hnRNP A1 markedly enhances hnRNP A1 binding with Octamer-binding transcriptional factor (Oct) 4 mRNA, which stabilizes Oct4 mRNA and Oct4 expression. 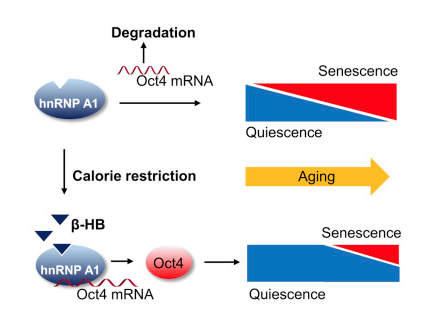 Oct4 increases Lamin B1, a key factor against DNA damage-induced senescence. Finally, fasting and intraperitoneal injection of β-HB upregulate Oct4 and Lamin B1 in both vascular smooth muscle and endothelial cells in mice in vivo. We conclude that β-HB exerts anti-aging effects in vascular cells by upregulating an hnRNP A1-induced Oct4-mediated Lamin B1 pathway.